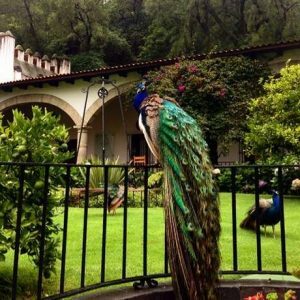 Mexico City, Patzcuara and San Miguel are all undeniably amazing every day of the year. But if that isn’t enough, we will also have the unique opportunity to observe and participate in authentic Day of the Dead activities in all three locations. The multi-day Day of the Dead (Dias de los Muertos) holiday takes place annually from October 31st to November 2nd. This significant celebration, has both a festive and reflective components. The celebration is a time to honor and remember friends and family members who have died. However, it is not a somber time. Residents visit cemeteries with food and gifts that their lost family members and friends would have enjoyed, they dance, they sing, they make beautiful crafts, they cook delicious treats, and build altars/shrines to the departed. 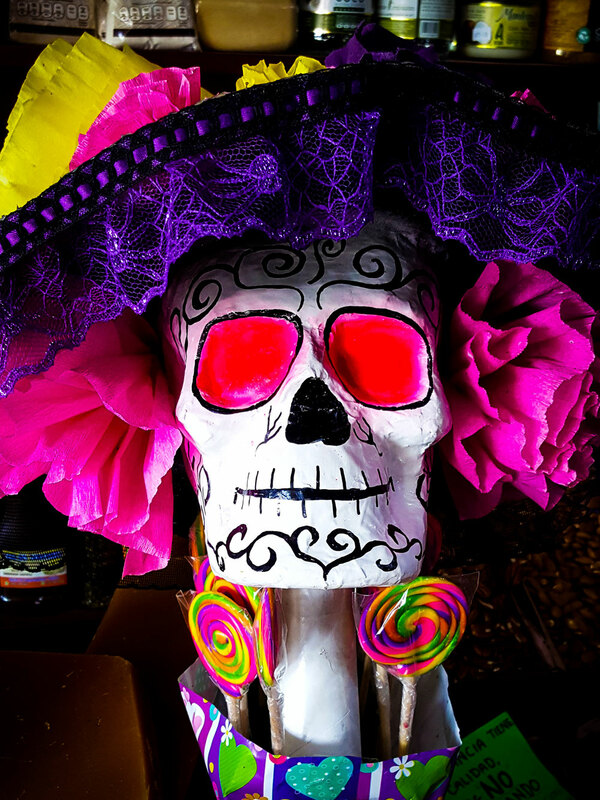 San Miguel de Allende throws a weeklong public party, known as the Festival La Calaca (Skull Festival). Whereas most of Mexico celebrates the holiday on November 1st into the next day, the city packs the calendar with parades, all-night parties, art exhibits, public altars and more. And if you’re game, get ready to paint your best Sugar Skull on your face because we will be celebrating the “Night of the Dead” in Patzcuaro. In cemeteries around Lake Patzcuaro, homage to the dead begins on November 1st and continues through the next morning. This is the only place where the “Night of the Dead” is celebrated with all-night candlelight vigils and celebrations. As part of this festivity, candle-lit boat processions make their way to Janitzio Island where revellers visit the church and graveyard. Visitors remain there for the night participating in a large festive vigil (with much imbibing involved!). 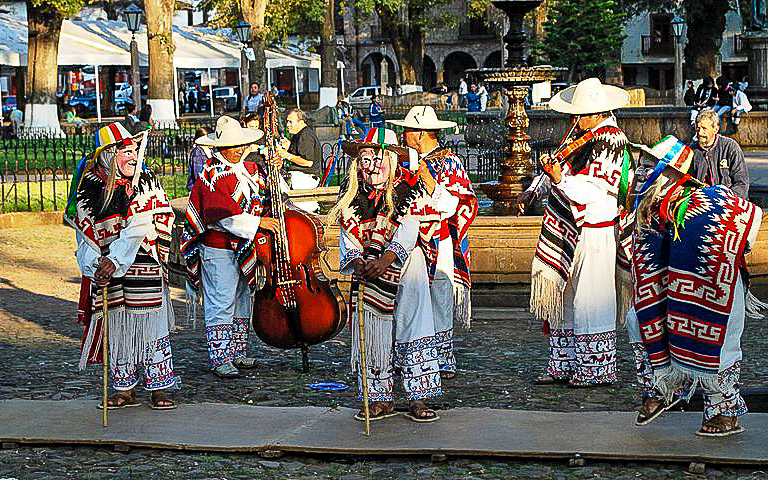 Patzcuaro is considered by many to be the best place to celebrate the holiday. Mexico City is gastronomic bliss. In recent years, Mexico City has gained a reputation for both its gourmet and street food. Foodies will tell you, few places are more diverse to eat and drink. It is no wonder with the blending of so many cultural influences. 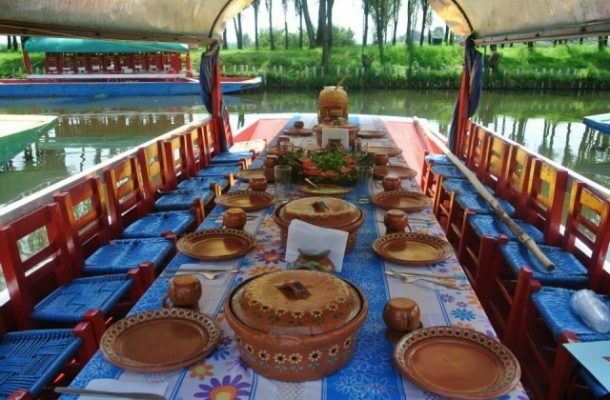 This trip will showcase the many tastes of Mexico with a highlight on traditional Day of the Dead cuisine. And if you like tequila, we have a treat in store for you. 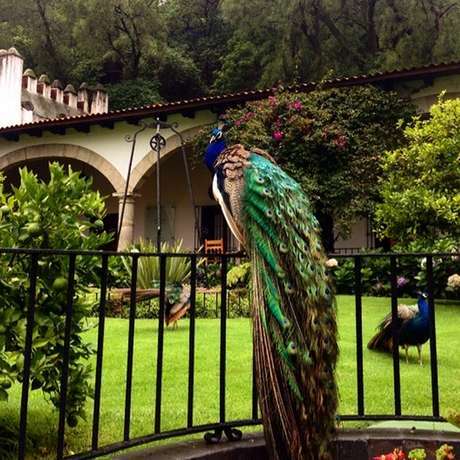 We invite you to attend an exclusive mezcal tasting hosted at a private residence. Here we will sample artisanal mezcals produced in local villages using the ancestral arts of cultivating, harvesting, fermenting and distilling agave.This is sure to be an evening to remember. Additionally, we will visit a local market with a celebrity chef to obtain the freshest ingredients to prepare traditional Day of the Dead dishes. We will use our market finds in cooking our dinner traditional fare. Our renowned cook will lead us through the preparation of our meal at a local residence. On our final evening, we tour the city seeking out the best gastronomy the city has to offer. 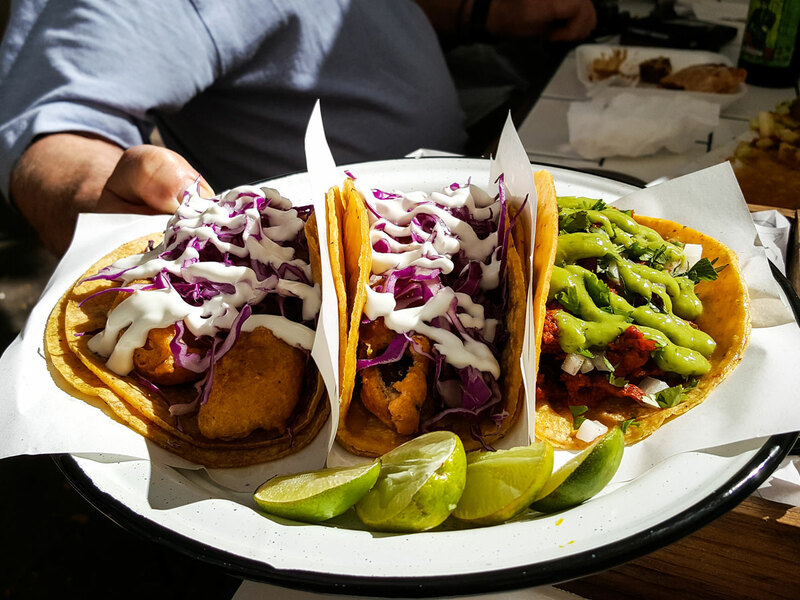 We will visit local markets and street stalls in a quest for Mexico City’s best Taco. 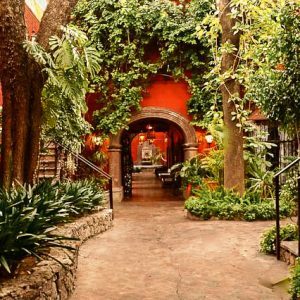 During this trip, we will visit two highly awarded cities: Mexico City called “Destination of the Year” by the New York Times in 2016 and San Miguel de Allende, named Travel + Leisure’s “Best City in the World,” 2017. 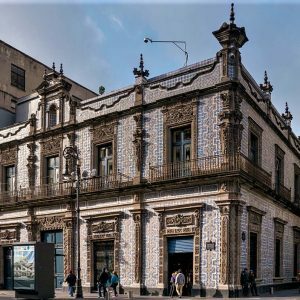 In addition to high accolades, both Mexico City and San Miguel’s Historic Centers have earned UNESCO designations. The same is true of Mexico City’s Xochimilco district. In addition to these UNESCO cities, this trip will take us to Patzcuaro, named a “Pueblo Magico” by the Mexican government. This designation is given to certain areas that have been selected because of their natural beauty, cultural riches, or historical relevance. Patzcuaro fits all those criteria and more. This magical town has a rich history dating back to the 14th Century and has retained its colonial and indigenous character. The village sits on a nearly 80-square mile lake. Additionally, Patzcuaro is one of only 100 United Nations’ Historic World Treasure Cities. We will also visit the UNESCO World Heritage Site of Teotihuacán. Not only will we walk the ancient pre-Aztec streets of the “City of the Gods,” we will soar high above in a hot air balloon to view “the place where the gods were created.” Teotihuacan is considered, the most significant pre-Aztec city in central Mexico and a top architectural and cultural site. The immense Avenue of the Dead built between the 1st and 7th centuries includes 2,000 residential apartment compounds, as well as the enormous Pyramids of the Sun and Moon. Here we will walk the same sacred grounds where the Aztecs once worshipped. But we are not done with UNESCO Sites yet. 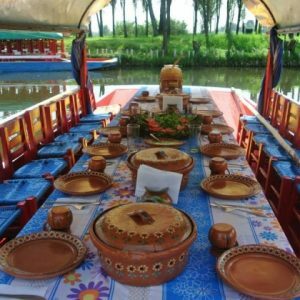 We will navigate the ancient Aztec canals of the UNESCO World Heritage Site, Xochimilco.Upon a trajinera (a brightly colored flat-bottom boat) we will traverse the canals and learn about chinampas (floating gardens). This thousand-years-old agricultural method of island plots of farmland between canals remains in use today. We will learn about the history and current use of this ancient ecosystem. On this trip we will visit two great culturally and historically significant cities; San Miguel de Allende and Mexico City. We will immerse ourselves in contemporary Mexican culture that has been a blending of indigenous, European and other ethnic influences. The confluence has resulted in a rich tapestry of culture and architecture as well as both fine and performing arts. 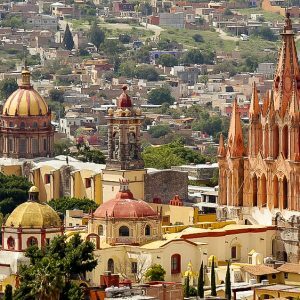 We will explore the country’s history dating back to its Aztec roots through the Mexican Revolution and colonialism up to the present day in two amazing cities. Arts in all forms are especially significant in Mexico City. We will visit sites which bring its influence to light. Probably most significant and famous would be the Palacio de Bellas Artes or the Palace of Fine Arts. It is a prominent cultural center and home of the Ballet Folklorico de Mexico. Additionally, we will view works of Diego Rivera from the early 20th century at the Presidential Palace and more. While a visit to the Presidential Palace to view artwork may seem like an unusual highlight, here we will see some fine examples of Diego Rivera’s murals. Rivera is known for his murals detailing the history and culture of Mexico. 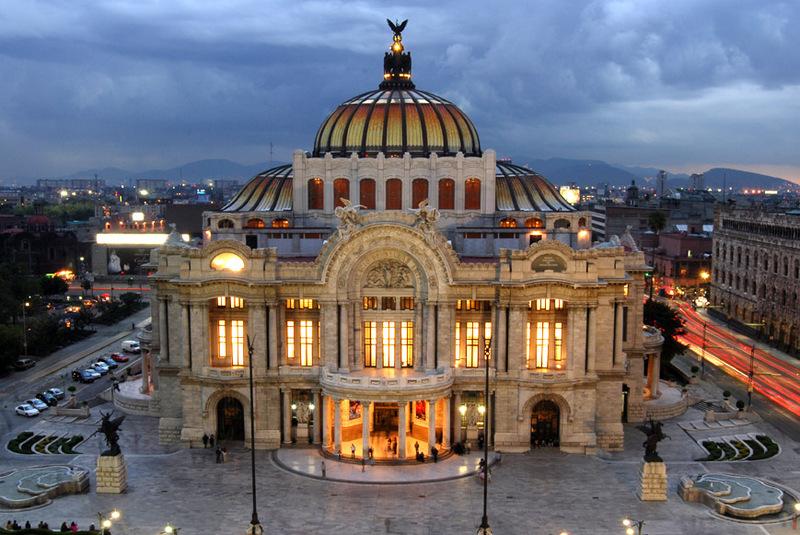 In 1904, construction of Palacio de Bellas Artes, the building designed by Italian architect Adamo Boari, began. Boari’s style favored neoclassical and art nouveau design. You can see this in the exterior features of the building. Construction of the building was halted around 1910 due to soft subsoil and the Mexican Revolution. After more than two decades construction resumed in 1932 under Mexican architect Federico Mariscal and was completed by 1934. The interior of the building is designed in the Art Deco style favored by Mariscal. The inside features murals by Diego Rivera and the theatre stage which is only open during performances is draped with a stain glass curtain comprised of nearly one million pieces assembled by Tiffany and Co.
Of course, a visit to any city is not complete without a stroll through the City Centre or Zocalo, also known as Plaza de la Constitución (Constitution Square) in Mexico City. Throughout history, this has been a political hub and often the scene of protests due to its proximity to the Federal Buildings. Since 1982, in an effort to revitalize the city center, the Zocalo has become an artistic center where festivals and cultural events happen. 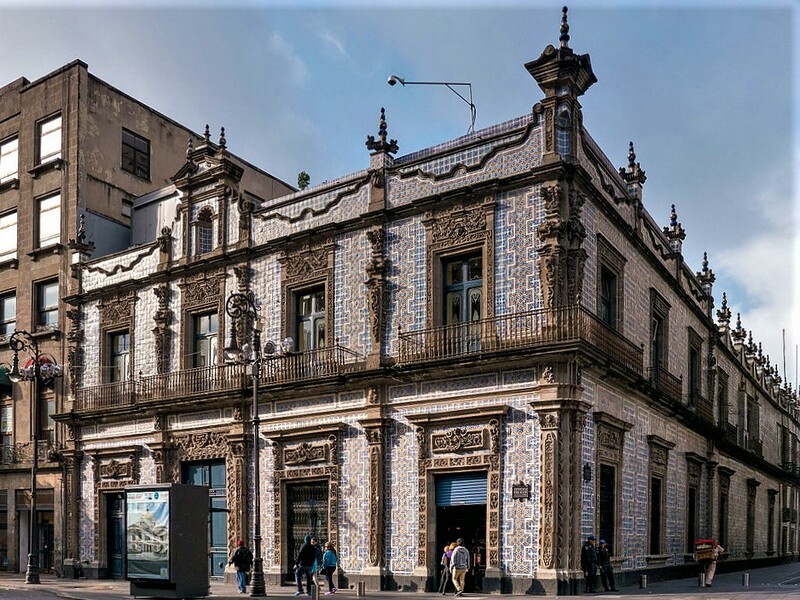 Throughout Mexico City we will encounter a wide range of architectural designs. It is common to find several styles in one building. A fine example of this is the Metropolitan Cathedral. This 16th century church is a fusion of baroque, neoclassical, and Mexican churrigueresque (named for Spanish architect José Churriguera) architectural styles.This hulking cathedral, constructed over the course of three centuries dominates the Zocala. The original cathedral, erected from stones of the Templo Mayor was demolished to build the present-day church. The cathedral, build on soft lake-bottom had been on the World Monuments Fund’s List of 100 Most Endangered Sites. Due to extensive restoration efforts, it was removed from the list in 2000. In Mexico City we can see the remnants of Templo Mayor. This was one of the primary temples of the Aztec people in their capital, Tenochtitlan, which is now Mexico City. The temple is believed to have been built in seven phases. The two stepped pyramids were dedicated to Huitzilopochtli, God of War, and Tlaloc, God of Rain and Agriculture. The temple was a focal point for the Aztec Religion and was believed to be the center of the universe. This would have been where the Aztecs, worshiped, made human sacrifices, and held great festivals and feasts. The site remains a working archeological dig. 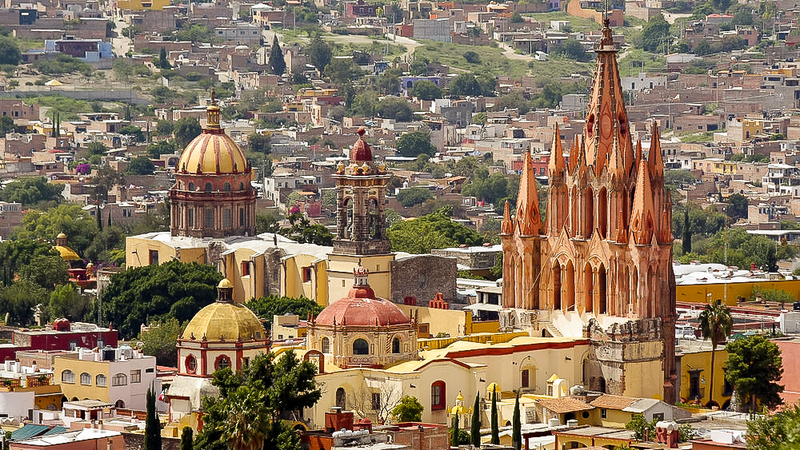 Like Mexico City, San Miguel’s architecture blends centuries of history and culture to form a unique cityscape all its own. 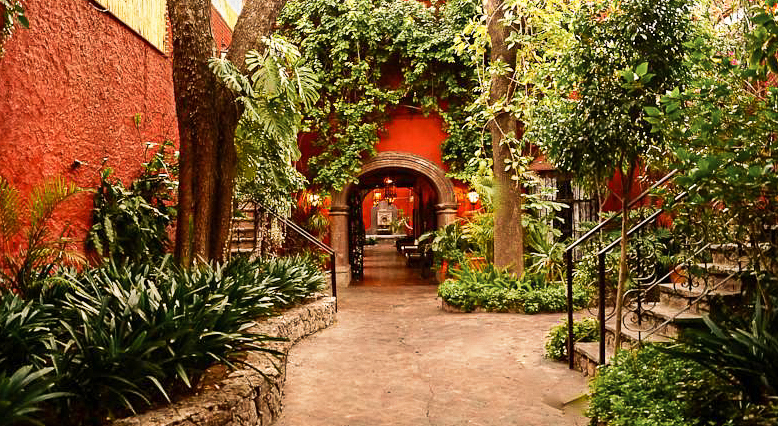 With color washed courtyards and narrow cobblestone streets, it is no wonder this charming town is the inspiration for creative types of all kind. During our visit we will make stops at several significant historical landmarks including the church and ex-convent of La Asunción, (Hermanas de la Concepcion) which houses the Ignacio Ramirez Cultural Center, part of the Instituto Nacional de Bellas Artes (INBA), often referred to as simply the “Bellas Artes.” Additionally we will make a stop at the picturesque Parroquia (Parish) de San Miguel Arcangel, whose pink spires loom above the treeline. The building’s neo-Gothic design is the creation of stonemason and architect Zeferino Gutiérrez. We will tour two highly awarded cities: Mexico City and San Miguel de Allende plus celebrate Day of the Dead in Patzcuaro. Also, this trip will focus on UNESCO Sites, history, culture and gastronomy.